We made some television history the other night: in a test for the NFL International Distribution, Adrian from TV2Go and us folks at IMG Mediahouse have successfully brought a 32APSK encoded signal across the Atlantic, with a datarate of 30Mbps using a 9MHz carrier! Since the start of the current NFL season in 2009, part of my job is to bring in feeds that originate in the US for an uplink stateside to NSS7. Our clients then downlink these feeds in Europe. In North America, DirectTV offers the NFL (and nearly 200 other channels) to domestic customers via their fleet of ten satellites. 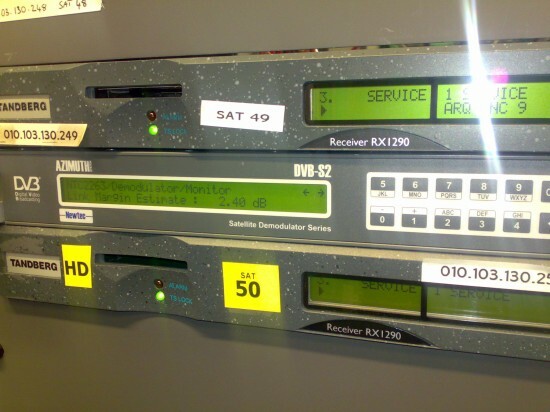 Using MPEG2 and H264 encoding, QPSK and 8PSK modulation are commonplace in satellite transmissions. However satellite bandwidth is expensive, and we’re dealing with demands of ever increasing datarates. Compression alone will only get us so far, so the only other way to increase throughput would be to increase phase modulation on the TX path. Lucky for us, the DVB-S2 spec has another trick or two up its sleeve. Using 32APSK modulation and Newtec equipment, Adrian, Ray and I successfully brought over a stable 30Mbps connection using only a 9MHz carrier. With our 5.6m dish, carrier to noise was 18dB – which is not too shabby. Newtec kindly provided an NTC 2263 receiver for this, which provides an ASI output – so we had to wire it into a Tandberg 1290 IRD to decode the signal into SDI. The results are gooood! In layman’s terms: 32APSK increases the amount of data that can be sent in comparison to 8PSK by about 30%: with 8PSK modulation on a 9MHz carrier, we’d be getting a maximum data rate of 20Mbps. In 32APSK we’re getting 30Mbps! As I understand it, 8PSK sends all bits in one phase revolution, or orbit. 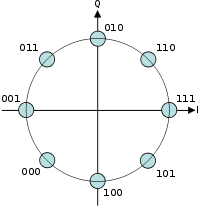 16APSK uses twice as much using two orbits, and 32APSK uses THREE orbits. How exactly this works is beyond me – but it’s sure as hell exciting to see the results! On the transmission front, Adrian was using an Adtec Encoder for this project. Although MPEG2 is commonly used in satellite transmissions, we were utilising MPEG4/H264 compression which is more efficient than MPEG2 – so that’s TWO new technologies in one fair swoop! The Newtec seems to be the only demodulator that can currently cope with 32APSK downlinks. Even though the Tandbergs have 16APSK and 32APSK as an option in the Licensed Features list, I understand these are hardware upgrades, not software upgrades. And speaking of Tandberg 1290 receivers, we encountered a slight problem: every once in a while (say every 10mins or so), the 1290 would glitch for a couple of seconds, as if it’s not coping with error correction (at least that’s what it looked like). Apparently this phenomenon happens because of i-frames sent at irregular intervals from the encoder. I understand that due to different on-board chipsets, the Tandberg motherboards 3.x are NOT causing these glitches, whereas the version 2.x do (at the time of writing, we currently have the latter ones here at IMG). “But what’s the application, Jay? Why go through all that trouble and pay for a new infrastructure?” I hear you ask. Simple really: saving money. If you can use the same satellite space for more data, then you’ll be able to use a 6 MHz carrier instead of 9 MHz or provide more services in the same space. Adrian suggests carriers as narrow as 3MHz for decent broadcast quality – superb for news gathering. 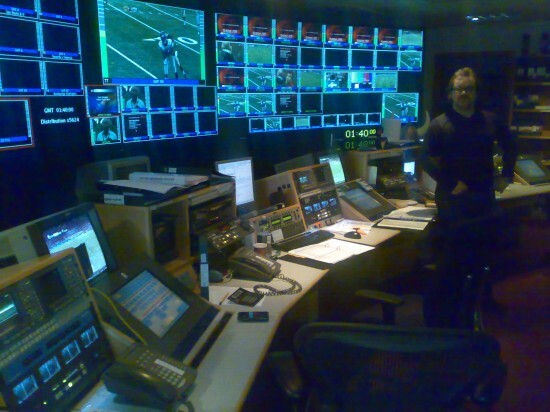 We’re hoping to utilise 32APSK with MPEG4 for the forthcoming NFL season 2010/2011 starting in September. Let’s keep our fingers crossed!